Salsa Chicken Casserole is a fun dinner option that everyone raves about! 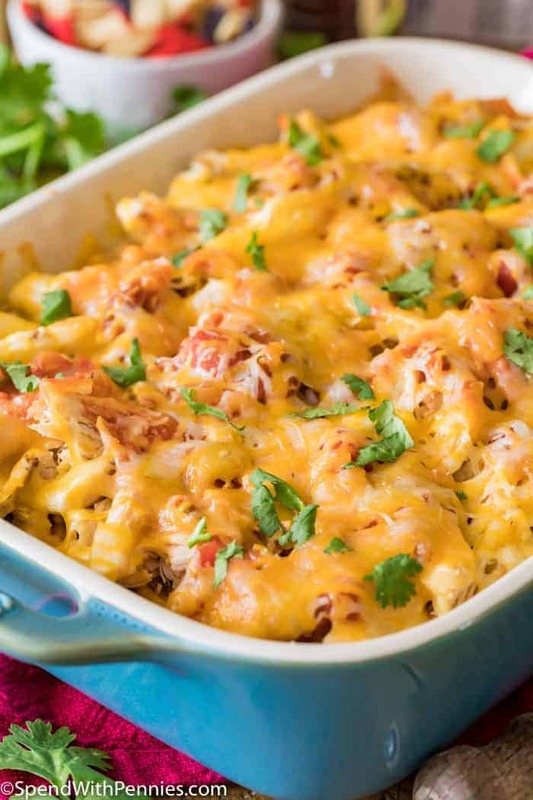 We love Chicken Rice Casserole any which way it’s prepared but this Mexican chicken casserole definitely tops our list! 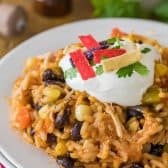 Spanish rice, corn, black beans, chicken, and salsa are topped with with cheddar cheese then baked until hot and bubbly! 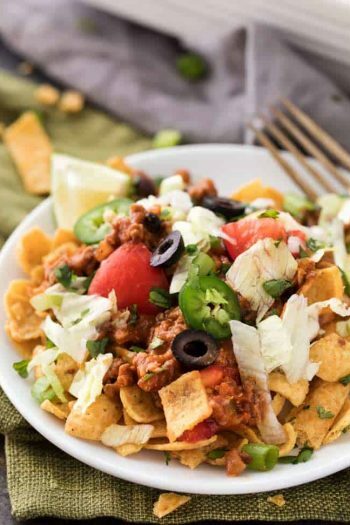 Top this easy recipe with sour cream, Homemade Salsa, jalapenos and crispy tortilla strips for the perfect meal! 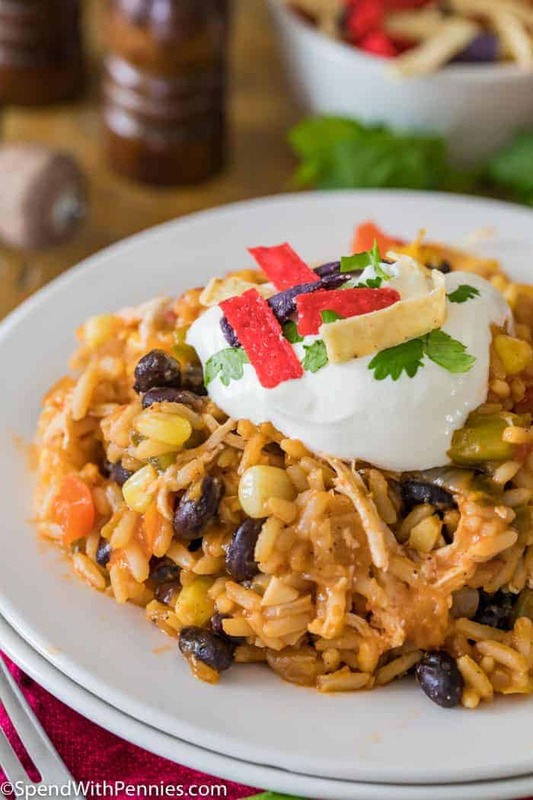 I am so excited to partner with Zatarian’s Rice to create this easy and delicious salsa chicken casserole! Rice is my 14 year old’s favorite food, she loves it served plain, as fried rice or even garlic butter rice! When she finds out rice is for dinner, she’s always thrilled so it’s a staple in our house! No matter what cuisine we are in the mood for, rice becomes a part of most of our meals. This month is national rice month, and to celebrate we are eating our fair share of rice at home. We quite often serve rice as a side dish, but when I need a complete meal, I go straight to a loaded chicken casserole like this one! 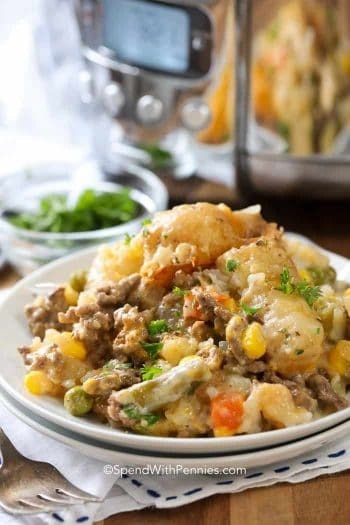 This easy casserole doesn’t require many dishes, can be prepared ahead of time and is comforting and delicious! I often make make salsa chicken because it has so much flavor so I knew it would be perfect to incorporate those same flavors into this easy casserole! 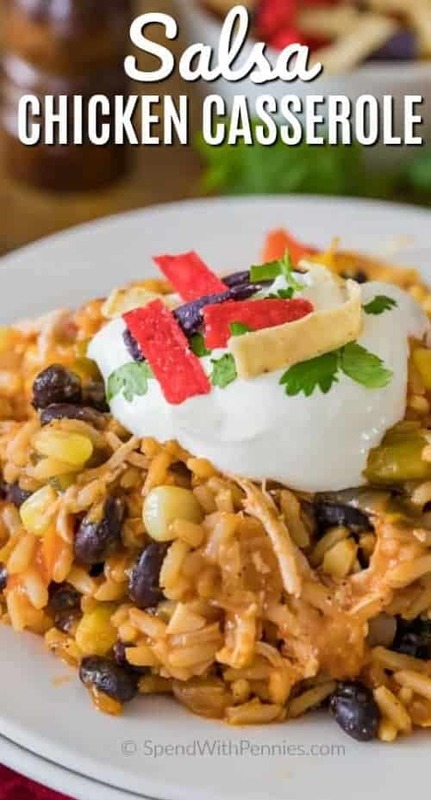 This chicken casserole recipe couldn’t be easier since it starts with Zatarian’s Spanish Rice Mix. 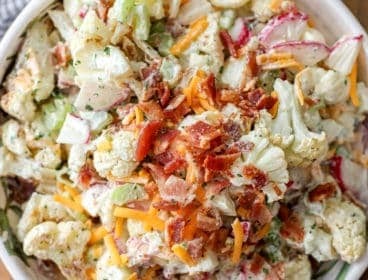 It’s already loaded with flavor and seasonings makes this casserole a total breeze! Combining Zatarian’s Spanish Rice Mix with a bit of onion, beans and some of our favorite veggies makes the perfect base for this dish. To keep this recipe extra fast, I use rotisserie chicken but any cooked chicken will do. I often make a batch of poached chicken to use in casseroles as it’s easy and always comes out tender! 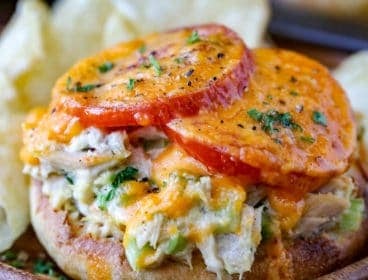 In a casserole dish simply layer your veggies, chicken, salsa and cheese and bake until golden and bubbly. 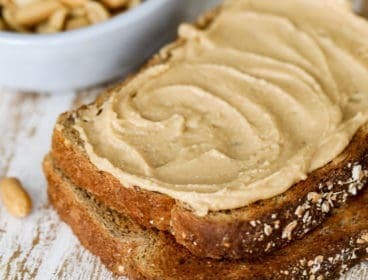 So easy and so good! 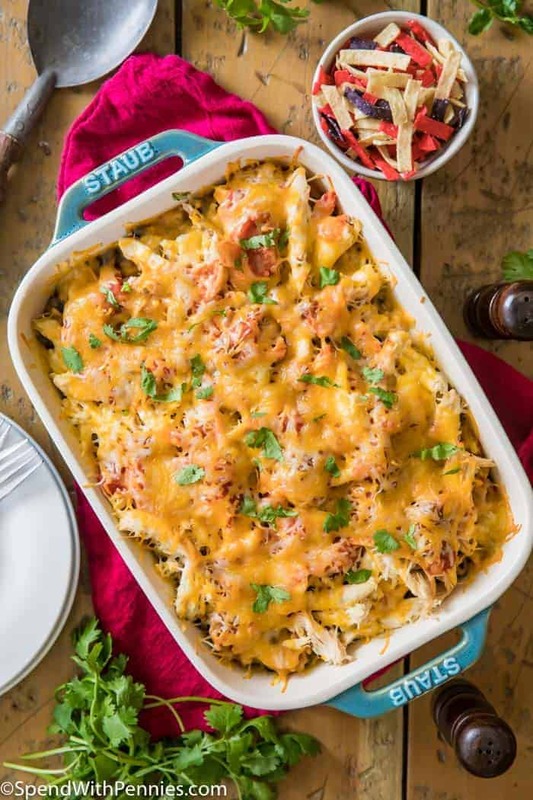 To serve, top this Salsa Chicken Casserole with your favorite toppings like sour cream, fresh jalapenos, cilantro, tomatoes or green onions, and dig in! This chicken casserole is easy to make and I know your family is going to love it as much as ours does! 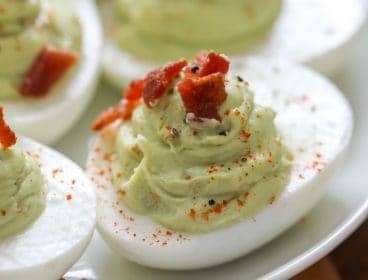 Serve this with a fresh Cucumber Avocado Salad, some crusty bread (or 30 Minute Dinner Rolls) or even tortillas for scooping! 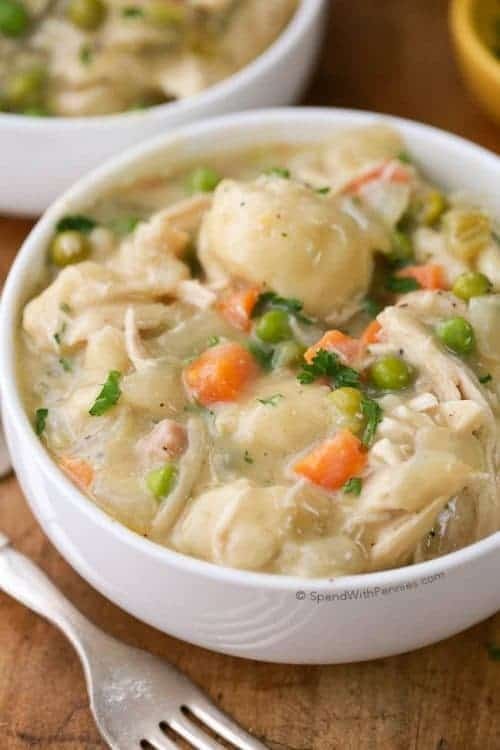 Can you Freeze a Chicken Casserole? 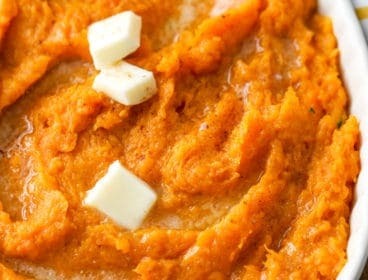 If you happen to have leftovers, this recipe reheats very well. 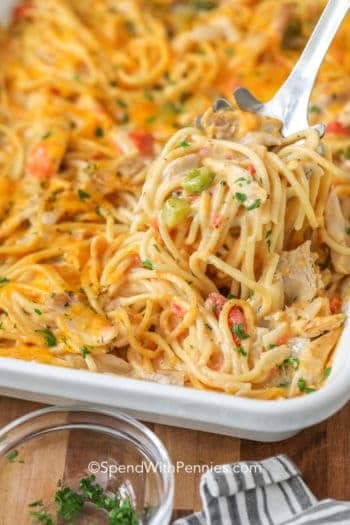 You can also make this ahead of time because this easy chicken casserole recipe freezes perfectly either before or after it has been baked. 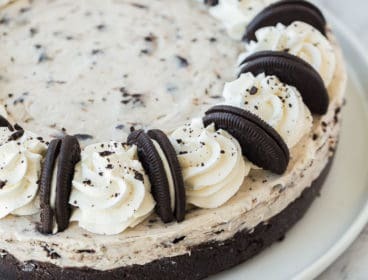 To bake from frozen, defrost in the refrigerator overnight. Bake at 350°F 30-35 minutes or until heated through. 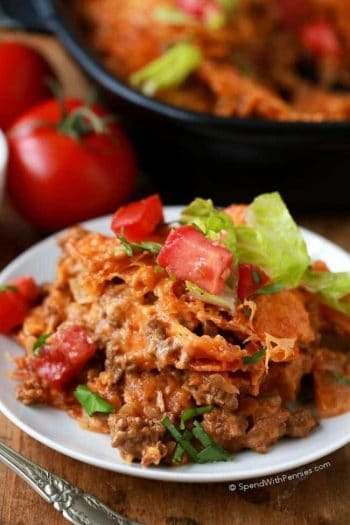 Mexican Rice Casserole – Great for leftovers! Crockpot Chicken and Rice – Reader favorite! Broccoli Rice Casserole from Scratch – Great side dish! Tender chicken and rice in a zesty cheesy casserole. Preheat oven to 375F and lightly grease an 11"x7" casserole dish with butter. Set aside. Place a large skillet over medium-high heat and cook onions and peppers in olive oil until tender (about 3-5 minutes). Add garlic and butter and cook until fragrant and butter is melted. 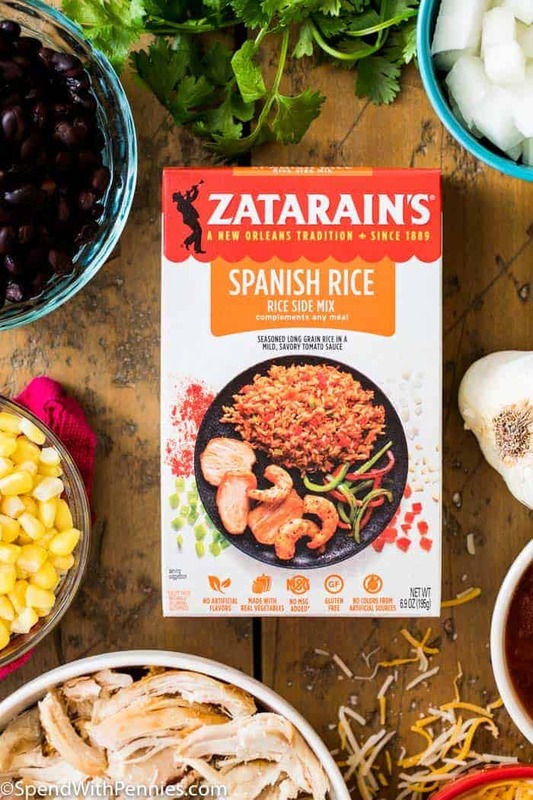 Add water, ZATARAIN'S® Spanish Rice and 1/2 cup of salsa. Stir well and bring to a boil. Reduce heat to low, cover, and simmer, stirring occasionally, for 20 minutes or until rice is tender. 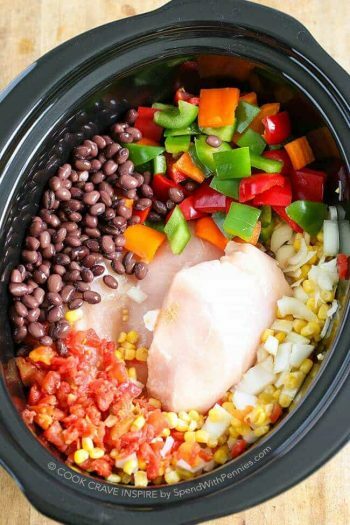 Add black beans, and corn and stir well. Transfer to prepared casserole dish and spread rice mixture in even layer into dish. Evenly spread shredded chicken over the top of the rice mixture. Top evenly with remaining 1 cup salsa and cover with cheddar cheese. Cover dish with foil and transfer to 375F oven and bake for 10-15 minutes or until cheese is melted. Serve, top with sour cream, cilantro, and corn chips, if desired. Top with sour cream, cilantro, corn chips, and/or other desired toppings. I have partnered with Zatarain’s Rice to bring you this belly warming recipe. Working with great brands I love allows me to keep bringing you the great recipes you love!